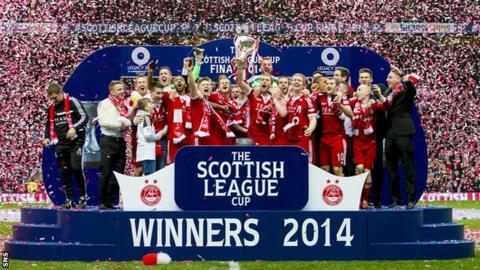 Aberdeen beat Inverness Caledonian Thistle on penalties to win the Scottish League Cup. Dons captain Russell Anderson's volley rattled the post in a first half of few chances. Niall McGinn fired wide for Aberdeen near the end of regulation time and Inverness winger Aaron Doran came close but could not prevent the shoot-out. Billy McKay's spot-kick was saved and Greg Tansey lifted his over, allowing Adam Rooney to claim victory. The Dons, looking to claim their first trophy since winning this tournament in 1995, had been pre-match favourites and their support dominated the 51,143 crowd at Celtic Park, which hosted the final instead of the under-development Hampden Park. Aberdeen were hopeful Peter Pawlett would recover from injury in time to feature in Glasgow, but manager Derek McInnes had to do without the influential winger. And Pawlett's heartache was shared by team-mate Jonny Hayes when a shoulder knock forced the winger to be replaced by Cammy Smith in the opening minutes. That substitution prevented any early momentum being built up and it took 25 minutes for either side to seriously threaten. Inverness struggled to clear from a corner and, when Anderson chested the ball down and struck firmly towards goal, the Highlanders were relieved first by the shot coming off the post and then for Richie Foran's presence on the line. John Hughes, who started James Vincent ahead of Doran, had urged his players to show cool heads in their first major final, but it was captain Foran who picked up the game's first booking for a couple of late challenges. The final sprung to life again when former Caley Thistle favourite Rooney went down in the Inverness box following a tackle from Josh Meekings and the defender was perhaps fortunate not to be penalised. Having been bettered for territory in the first half, Inverness were much more forceful at the start of the second period as they sought to win their first major honour. Jamie Langfield dropped a cross and was relieved to see the ball cleared by Anderson as Foran closed in. The goalkeeper was much more assured when dealing with a Tansey free-kick, but the momentum was firmly with Inverness. However, the lack of decent efforts at goal was typified when Marley Watkins took a fresh-air swipe from a promising shooting position. The pendulum swung back towards Aberdeen for a short spell and shots by Ryan Jack and Barry Robson drew saves from Dean Brill. At the other end, Foran headed off target before claiming unsuccessfully for a foul against Andrew Considine. And, as extra-time beckoned, McGinn spurned a glorious chance to seal a Dons win when he fired wide following a mistake by Tansey, Meekings just doing enough to deflect the striker's effort over. Doran came closest to making the breakthrough in the additional half-hour, his awkward bouncing shot pushed out by Langfield before penalties ensued. Though Nick Ross and Doran were able to find the net from 12 yards after McKay and Tansey had been unsuccessful, solid strikes by Robson, Nicky Low, Scott Vernon and Rooney secured the trophy for Aberdeen. With McInnes's men also in the Scottish Cup semi-finals, this victory could pave the way for a trophy double in his first season in charge of the Pittodrie side. Match ends, Aberdeen 0(4), Inverness CT 0(2). Penalty Shootout ends, Aberdeen 0(4), Inverness CT 0(2). Goal! Aberdeen 0(4), Inverness CT 0(2). Adam Rooney (Aberdeen) converts the penalty with a right footed shot to the high centre of the goal. Goal! Aberdeen 0(3), Inverness CT 0(2). Aaron Doran (Inverness CT) converts the penalty with a right footed shot to the bottom right corner. Goal! Aberdeen 0(3), Inverness CT 0(1). Scott Vernon (Aberdeen) converts the penalty with a right footed shot to the bottom right corner. Goal! Aberdeen 0(2), Inverness CT 0(1). Nick Ross (Inverness CT) converts the penalty with a right footed shot to the high centre of the goal. Goal! Aberdeen 0(2), Inverness CT 0. Nicky Low (Aberdeen) converts the penalty with a left footed shot to the bottom right corner. Penalty missed! Bad penalty by Greg Tansey (Inverness CT) right footed shot is too high. Greg Tansey should be disappointed. Goal! Aberdeen 0(1), Inverness CT 0. Barry Robson (Aberdeen) converts the penalty with a left footed shot to the bottom right corner. Penalty saved! Billy McKay (Inverness CT) fails to capitalise on this great opportunity, right footed shot saved in the bottom left corner. Penalty Shootout begins Aberdeen 0, Inverness CT 0. Second Half Extra Time ends, Aberdeen 0, Inverness CT 0. Attempt missed. Scott Vernon (Aberdeen) header from the centre of the box misses to the right. Attempt missed. Aaron Doran (Inverness CT) right footed shot from outside the box is high and wide to the right from a direct free kick. Foul by Nicky Low (Aberdeen). Nick Ross (Inverness CT) wins a free kick in the defensive half. Attempt missed. Nicky Low (Aberdeen) left footed shot from outside the box is high and wide to the right from a direct free kick. Ross Draper (Inverness CT) is shown the yellow card. Nicky Low (Aberdeen) wins a free kick in the defensive half. Attempt missed. Aaron Doran (Inverness CT) right footed shot from a difficult angle and long range on the left is high and wide to the right. Scott Vernon (Aberdeen) wins a free kick in the defensive half. Substitution, Aberdeen. Scott Vernon replaces Andrew Considine. Second Half Extra Time begins Aberdeen 0, Inverness CT 0. First Half Extra Time ends, Aberdeen 0, Inverness CT 0. Attempt missed. Adam Rooney (Aberdeen) header from the centre of the box misses to the right. Attempt missed. Josh Meekings (Inverness CT) header from the centre of the box is too high. Corner, Inverness CT. Conceded by Jamie Langfield. Attempt saved. Aaron Doran (Inverness CT) right footed shot from outside the box is saved in the bottom right corner. Attempt missed. Greg Tansey (Inverness CT) right footed shot from outside the box is just a bit too high from a direct free kick. Substitution, Inverness CT. Ryan Christie replaces Richie Foran.